Your [wasted green] tax dollars at work | Watts Up With That? Former employees of Solyndra, the shuttered solar company that exhausted half a billion dollars of taxpayer money, said they saw questionable spending by management almost as soon as a federal agency approved a $535 million government-backed loan for the start-up. A new factory built with public money boasted a gleaming conference room with glass walls that, with the flip of a switch, turned a smoky gray to conceal the room’s occupants. Hastily purchased state-of-the-art equipment ended up being sold for pennies on the dollar, still in its plastic wrap, employees said. As the $344 million factory went up just down the road from the company’s leased plant in Fremont, Calif., workers watched as pallets of unsold solar panels stacked up in storage. Many wondered: Was the factory needed? On Friday, company executives are scheduled to appear before a House committee investigating how Solyndra obtained its loan and whether the Obama White House rushed its approval for political reasons. Chief Executive Officer Brian Harrison and Chief Financial Officer Bill Stover were supposed to face a grilling about the company’s spending and collapse, but they announced Tuesday that they would assert their Fifth Amendment rights because of a criminal probe of the company by the Justice Department. What should concern us all is that very little of this so-called “stimulus” money was actually spent on creating jobs. Jobs in the U.S. I mean. I hear a lot of it ended up in China and other countries. I suspect a lot of it will eventually make its way back into Democrat Party coffers in the guise of “union dues” and other money-laundering tricks. What astonished everyone was how quickly the company went belly up. Perhaps it would have been better had the country purchased the unsold panels for all those solar parking structures we’re seeing out here rather than having the $535 billion just go up in smoke. This story has legs. Even the green-washed CBC knows it, and I only hope that the Climategate story can ride the coattails of this one. Don’t worry if we run out of your money…we’ll tax the rich…. I’m unsure on this. Silicon fab plants are expensive. Very expensive. The likes of Intel and AMD spend $10-$20bn on each new plant. Obviously solar panels are not on the same scale as this, but I don’t know if $350m to set one up is excessive or not. Very few private companies should be supported by the government because if something is viable, it will get developed and sell itself, which so far most “green industry” ideas wll not. The above article also shows how bad politicians are and how they waste our tax dollars on a daily basis. I know exactly what the former employees must be feeling. I saw this sort of abuses at former working places. The worst part is that often the officers go out and do it all over again, no consequences and employees and shareholders are left behind. Disgusting work and moral ethics will make you rich in this world. I don’t know why anyone should be shocked. I doubt anything was actually illegal, except maybe if they were planning an IPO, in which case the SEC might have had something on them. what’s nice about the Solyndra debacle is that it puts a fine point on the true goal of the entire AGW movement – which is to enable a governmental and corporate theft of hundreds of billions of dollars. Well, Yes. Yes I will. I condemn anything which cannot survive without endless and massive government subsidies as far as the mind can comprehend. The entire AGW movement truly is the most massive Fraud in modern history, and here for the entire world to see is the purpose of that Fraud. Theft, plain and simple. Not some grand political conspiracy – just old fashioned theft. How lucky we are that the subsidies paid to oil companies are not squandered in the same way! This is exactly the problem with the merging objectives in a private-public partnership. Standing on its own Solyndra would have been conserving capital, and not open the new facility unless needed. However, the government objective was “stimulus” and also to have something tangible that the government could show that they accomplished something. It is a testament to how bad this green jobs farce is that this blew up so quickly. Follow the money , there are all sorts of ways you spread the cash to friends and family when you got a bucket load of government cash burning a hole in your pocket. And if your smart you can make money on the way down too, buy dear sell back cheap , buy what you don’t actual need sell cheap to someone else , a nice fat and legally binding contract which pays off even if no work was done etc. Any amount spent on new plant is excessive if you are well aware ahead of time that you have no conceivable market for the products it is being built to produce. This story reminds me of Al Gore, Maurice Strong (currently an advisor to China) and the Molten Metal scam. How anyone can believe these PROVEN conmen I cannot understand. On the first“Earth Day, April 17, 1995 when the future author of An Inconvenient Truth traveled to Fall River, Massachusetts, to deliver a green sermon at the headquarters of Molten Metal Technology Inc. (MMTI). MMTI was a firm that proclaimed to have invented a process for recycling metals from waste.Gore praised the Molten Metal firm as a pioneer in the kind of innovative technology that can save the environment, and make money for investors at the same time. So now we have the third “musketeer” of the Chicago Climate Exchange, Obama pulling yet another scam. This is only the tip of the government waste iceberg. Our government climate scientist friends got millions of dollars for their projects (including salary increases) in the name of “stimulus”. And the forecast for the climate scientists for 2012? GOOD TIMES! By the way, look at the first bar chart in this report. Notice the pink bar at the top of 2009. Guess what that was? That’s right – the “Recovery Act” aka stimulus. So while you and I were suffering through one of the worst economic years in recent memory, our climate friends were getting their budgets increased by $0.5 BILLION over and above their appropriated increases!!! The illegality came when the White House pushed the folks making the loan to do so without due diligence. Those reviewing the company’s financial status predicted the collapse almost to the day. The Solyndra technology was based on non-silicon manufacturing process. Their bet was on continued high silicon pricing. Silicon market crashed after Solyndra statred up and as we all know – Solyndra is history now. I count four US based solar companies that have closed or filed for bankruptcy this year alone. Of course Solyndra, Evergreen Solar, SpectraWatt – (Intel Spinoff company), and Solon North America. It is a very good example of what happens when the government intrudes into the private sector. We saw it in the housing / banking industries. The health care industry has priced itself out of reach of the average household. They are running an unsustainable program for mandatory retirement accounts. Now they think they should use money, that someone had to earn, to fund stupid venture capital programs, that just happen to benefit supporters of the administration. Did we need government funding to start any of the fortune 500 companies? I doubt there is any example where this has worked in the past. Limited government is what made this country great, and if we don’t return to that concept, there is only two possible outcomes. And the one we want, involves defying everything we know, about human behavior. The bankruptcy of Solyndra was probably intentional. It was, certainly, foreseen long before it happened, witness the loan restructuring that occurred in February, which happened to put the public on the bottom of the repayment list. Of course, the story doesn’t stop there. All of this was done to produce a more expensive, less reliable form of energy, in order to bilk the public out of even more capital. The FBI raid seems suspiciously like a move to bury the evidence. Does anyone remember the FBI handling of the evidence at Waco? Lost video tapes, lost the front door, bulldozed the crime scene, etc. It is a violation of federal law to place private investors ahead of taxpayers, as was done here, but I don’t know if criminal penalties attach. Anyone know? It’s okay, Obama can issue pardons in 2013 before he leaves office. Then we can hire Micheal Meyers to do a docudrama about how the company was sabotaged by big oil and Republican politicians. If stupid people could just be better educated about climate change, this would never have happened. Another round of stimulus and a cap and trade law would have assured the success of Solyndra. See? The conservatives are destroying jobs again. That’s how they’ll spin it. I would say their bet was on cap and trade as much as anything else. I wonder how much of the Federal money was spent trying to speculate on the carbon market before it collapsed? My final question to izen: If those ‘subsidies’ to oil companies are bad, how are subsidies to Solyndra good? Tom, I think your adding a zero to the amount to build a new silicon fab. Usually I see numbers in the $1.0-$3.0 billion range, with a good portion of that having to do with the building of a “clean” environment. Not sure if solar cells require the same diligence. $500 Million to $750 million is the RIGHT cost for a COMPLETE SEMICONDUTOR FAB shop. NOT 5 to 10 Billion. That’s the cost of a major (delayed by Enviros) nuclear power plant. There’s more than people hiding behind the gray smoke of global warming. My post was intended to highlight the difference in attitude there tends to be towards subsidies – rather than a level playing field. Either subsidies are good or bad – depending of your ideological outlook. But both ‘sides’ tend to favor the subsidies for industries they support and attack subsidies for industries they dislike. Actually ALL commercial enterprises are dependent on government subsidy to some extent whether direct or indirect. The social infrastructure of roads, clean water, sewage, police, fireman and power generation standards underpins the functioning and workforce of any industry. That was a condition of the stimulus package…….. that any money the govt put up was suppose to be first to be paid back. Yes, it was a violation of federal law. Penalty? I’ll have to do some more digging. While this is all interesting, the fact remains that the subsidized portion of big oil, pales in overall comparison to subsidies given to other industries. So if we’re going to cut it for “big oil”, why don’t we just cut them for everybody? “Actually ALL commercial enterprises are dependent on government subsidy to some extent whether direct or indirect. The social infrastructure of roads, clean water, sewage, police, fireman and power generation standards underpins the functioning and workforce of any industry”. Izen, I’d more or less agree with that. And providing that social infrastructure is just about the limit of government competence, ie (here in the UK for example) they can just about manage to do that, expensively, not very well, but tolerably. Its when they step outside of those limitations that they get almost everything hopelessly wrong. 1. Tax breaks are a lot different from direct pay subsidies like Solyndra got. If the oil industry doesn't make a marketable product the tax break is worthless. I'd be much happier to see the Solydras of the world just get tax breaks. 2. In the case of the oil industry, the tax breaks are the ability to write off the fees charges by other national governments to extract the oil. This comes within the realm of operating costs that pretty much every industry writes off. Your equating the two was out of left field. Far Left field. You were doing alright until your last paragraph, when you decided to tack-on that neo-Marxist claptrap. You’re trying to reframe the long-standing social contract in redistributionist terms. In the US, most of those are local and state functions. If Kalifornia wants to subsidize near-criminal businesses I have no problem with it. There are 49 other states that would welcome my tax dollars. Excellent points. Remember, though, that in enviro-speak any money squandered given to (now bankrupt) “green” companies like Solyndra are called “investments”. Well you obviously don’t know much about Solar cells, or Silicon Fab Technology. Intel and AMD spend that kind of money on equiplment that is capably of fabricating structures as small as around 20-30 nm; just one twentieth of the wavelength of yellow light, and “printing” billions of them on dinner plates as big as 12 inch gramophone records. Silicon Solar cell makers on the other hand try to grow things that are four inches square or maybe six inches, that you can just about draw by hand. And you, like evidently numerous others know nothing at all about the process that Solyndra used to make their solar “panels”. Solyndra apologists blame the Chicoms and their “cheap” labor for putting Solyndra out of business. Nothing could be further from the truth; they never had a business in the first place. They never had a workable solar panel or solar cell technology to begin with. They used a thin film solar sensitive “paint” to lay down their “solar cells” inside a hollow glass tube; perhaps about four inches in diameter. Now a four inch diameter glass tube intercepts exactly the same area of solar energy, as a four inch wide flat strip. And not coincidently, a four inch diameter glass tube contains three times the glass area as a flat strip has. Gee whizz, it also has three times the area of solar sensitive thin film as does a flat plate. Even thse materials cost money, and you can’t use Pi times the area of something, and beat out in cost, someone who doesn’t do that. Well you see the sunlight only falls on half the Solyndra tube at a time; but the thin film doesn’t stop it all, so sunlight proceeds on through the top film, and impinges on the bottom film; and even then the film doesn’t stop it, so additional solar energy proceeds past the tube to a refelective mirror layer, that sends the remaining solar energy back through the tube. If one assumes that the Solyndra Tube has the same conversion efficiency (20-23%) that say a conventional silicon cell from perhaps Sunpower, or similar Solyndra competitors get, the inference is that Solyndra’s thin film layer perhaps has less than 5% conversion efficiency. The multiple strike system implies that any single layer is very inefficient, in absorbing and converting solar energy into electricity. An efficient solar cell would perhaps reflect ALL of the solar energy that the PV cell can not convert to electricity (the IR), and then absorb and convert the spectral portion it can convert. Removing the part that only heats the cell, which lowers its efficiency, would be part of a good panel design. Some vendors have a multijunction, multi bandgap cell sandwich, which captures a wider swath of solar spectrum energy. Solyndra could make their solar tubes at zero cost; spray the material on the tube inner wall from a garden hose; and they still would have gone belly up. In solar PV conversion NOTHING matters except conversion efficiency. Cell cost is almost irrelevent. Consumed land area is the name of the game, and nobody who researched the various solar vendor’s technologies, would ever have wasted their precious land area on anything but the highest conversion efficiency solar panels. Try to google and see if you can find where they state what the solar to electric conversion efficiency is for their tubular panels. And guess what happens when you parallel a solar cell that is directly facing the sun on the top of the tube, with another one; or portion of the same diode that is edgewise on to the sun, and receiving almost no solar energy at all. The second one current hogs the former. The “media” has/ve focussed on the money and political shenanigans of the Solyndra debacle. The real scandal is in the Solyndra “Technology”. They went belly up, because nobody in their right mind, would have bought a Solyndra solar panel; taxpayer subsidized or not. Just another example of a long line of examples of fatal conceit. Good point, except you’ve gotten the subsidy relationship backwards. The infrastructure, water, sewage, police, etc. was accomplished only through the commercial enterprises’ subsidy to governments, via direct or indirect. It is important to distinguish the difference, else, government tends to think they are the source of wealth, and thus the rightful owner of the wealth. Well guess who is the principal beneficiary of “big oil” with their “subsidies”. The Federal Government makes far more money from “big oil” than do the oil companies; they aren’t about to kill the source of the goodies in the trough that the feds swill in. But Silicon Valley has plenty of Corporate welfare deadbeats, eager to “educate” Washington politicians to the benefits of their support of “Green ” “technologies”, specially the ones those “moneybags” won’t risk their own money on. Actually ALL commercial enterprises are dependent on government subsidy to some extent whether direct or indirect. Elizabeth – Elizabeth Warren, is that you? Suppose you borrowed a couple hundred thousand from a regular bank to run your business. Now suppose later on you couldn’t make your payments on time, and they asked you to come to a meeting so they could ask you some questions. If you started pleading the 5th at that meeting the sheriff would show up in a few hours to arrest you. Suppose it was found out that you had bought the president of that bank a new boat just before or after the loan was approved through his intervention. The sheriff would be at his house shortly after picking you up at yours. WHY IS IT OKAY FOR THE PRESIDENT TO GIVE HUGE AMOUNTS OF TAXPAYER MONEY TO HIS FRIENDS AND SUPPORTERS? George, didn’t Calif pass some law about new construction, solar panels, etc specifically about buying in-state and Solyndra? ……..and also give Solyndra an in-state tax break or subsidy of some sort? Izen, before you shoot from the hip it would be worth your while to investigate how the Oil Industry stacks up. It is not just the tremendous value that Oil Companies create for all consumers and other industries that use the fuels but the employment they provide, as well as their contributions to taxes that makes them stand out as pillars of our society and the primary contributor to the comfortable life styles that most of the West & developing nations enjoy. Just think about how many products you touch daily that are from Oil. Just think about how often you use a car, or travel, or buy food/products that have been delivered using hydrocarbon fuels. There is no comparison. Solyndra was a very unfortunate waste of taxpayer money, a net burden to Society. Oil Companies are huge net contributors to Society. >U.S. Sen. Charles Schumer, D-N.Y., is proposing to end what he says are $4 billion a year in tax >subsidies to the biggest oil companies. A little while back, I went to the Exxon website to see how much tax they pay every year. It is in the order of hundreds of billions of dollars. I recall that the combined payment of direct taxation by “big oil” is close to 1/2 trillion dollars a year. This doesn’t include the taxes paid by shareholders, employees and suppliers. For my business, this is about 3 times the corporate tax paid. My guess is big oil annually contributes well over one trillion in direct and indirect taxation world wide. I agree they shouldn’t get “subsidies”, but deferred taxes and write-offs for capital equipment are not subsidies. Don’t take my word for it. Read the annual reports of Exxon, BP, Total, Shell and Chevron. Are you saying that the guvmint didn’t do their due diligence with this product? Shame on them. Solyndra … Soylent Green is there a connection? The Solyndra screwup is unfortunate and likely preventable but there are lots of pieces to this story, not least is the recent huge investment in solar by China, over $20 billion dollars, allowing their plants to undercut just about anyone. A good chunk of China’s success (not all, of course) has been from them gaming the system, such as keeping the yuan artificially low against the greenback. Had they played it straight all along, they likely would have lost a significant chunk of manufacturing jobs to India and Vietnam years ago. It’s easy to point fingers at the current administration but the Solyndra deal goes back to 2005 and the Bush administration did try to fast-track it. And while a big deal was made about investment by one of George Kaiser’s firms, a curious omission was that another very large early investment was made by the Walton family ( not exactly Obama’s best buddies ). And let’s not tar the entire solar industry with Solyndra’s brush – the year to year growth in solar running close to 7%, WAY above the rest of the economy as a whole. It’s perfectly righteous to be indignant over the loss of taxpayer dollars but the big failure of the White House is that several trillion dollars of America’s life savings have been stolen and no one indicted, unless we all believe Bernie Madoff is to blame for the global financial catastrophe. I haven’t read all comments, but I just do not believe that any company has spent 10 billion on a new plant. Proof please! Are Solyndra and Soylent Green connected? Maybe indirectly, although I have yet to see anybody promote the Soylent Green industry as the path to jobs, economic growth and prosperity. I am framing the ‘long-standing social contract’ as the RESULT of the creation and distribution of resources. “Good point, except you’ve gotten the subsidy relationship backwards. The infrastructure, water, sewage, police, etc. was accomplished only through the commercial enterprises’ subsidy to governments, via direct or indirect. Fair point; I was talking of government ‘subsidy’ as that was the thread topic, but that does imply a unidirectional process. As you rightly point out the benefits and costs run BOTH ways. I think that historically the relationship between government and business has been symbiotic rather than parasitic. The ‘rightful ownership of wealth’ in such interdependent systems tends to be a matter of legal tradition and social convention. The ‘long-standing social contract’ and similar political epidemiologies arise from the co operational synergies that business and government reach to distribute that ‘wealth’. It’s the biggest energy related Executive Branch scandal since Teapot Dome (or at least since Billy Sol Estes.) It was a bribe in return for a favorable decision. Ten billion is too high for a new chip fab; more like $6 billion for a 22-nm plant but if the tech scales down, as it seems to do every 2-3 years, add another billion in upgrades. Solar panels are lot like battery packs – you can not mix old discharged batteries with new ones New batteries will spend themselves in futile attempt to charge old batteries instead of driving loads. Parts of the solar cell that have low light will shunt current from parts that are exposed to lots of light, taking efficiency of panel way down. This is why uniform illumination of panel is very important. The only way around this problem is to actually separate large solar cell into bunch of small cells and use complicated controllers/power supplies arrays to sum output of each little cell together. This is very expensive and generally not being used. I have no idea how Solyndra’s panels managed to work around this, but given that they did not publish their technical data anywhere, I suspect that they didn’t. In absence of actual technical info that would show that this thing works as well as regular flat panels, I’d say the whole idea is a total fraud. To me, the requirement for white paint on the roof is a dead giveaway or how ridiculous this whole thing is. When the Federal Labour government took over from the Liberal Co-Alition in 2007 they inherited a very healthy surplus of some 100’s of billion dollars. Although Australia’s economy was still running strong despite the downturn in the GE the Rudd/Gillard government emptied the bank by issuing stimulus packages to all people working, and including some overseas residents. This put Australia into debit by almost the same amount as they were in the black. The big winners of the stimulus package were department stores selling Chinese large screen LCD TV’s. Carbon tax is a warm and fuzzy way that the Labour Government can get back into surplus and fund all those new positions in “Climate Change Departments” regardless of whether they personally believe in the Al Gore man made climate change story. Unfortunately governments in opposition also realise this. It’s a high crime, Mr Demeanor. There isn’t very much information on these “subsidies”, but reading between the lines, it appears to relate to favorable tax treatment of exploration expenses. So, what’s really happening is that the government is NOT TAKING as much money as they might otherwise. If a burglar decides not to rob me, is that the same as handing me cash? No? Didn’t think so. Only on the left is not taking someone’s money a subsidy. If the government writes you a check and increases your GROSS income, that’s a subsidy. That’s not what’s happening in this case. Suyts, check out the $75 million from Argonaut, please. Disgusting work and moral ethics will make you rich in this world. Booty is only sin deep (just cut a corner) in the land of bilk and money. This is exactly the problem with the merging objectives in a private-public partnership. Standing on its own Solyndra would have been conserving capital, and not open the new facility unless needed. Well obviously you werent around during the dot com era. Lots of the same kind of abuses but no government private partnership. So case not proven. There are no clear cut rules about this kind of thing. You are communicating via the Internet. That started on the road to success as a government project and funded by government people with a bit of imagination. Clearly that was a success. Considering that a large fraction of private businesses fail, expecting private government partnerships not to fail occaisionally is too high an expectation. I feel your pain about tax dollars being wasted but I suspect it is not quite as bad as portrayed, since most of that money did circulate around the economy. It did help moderate a serious problem which was that money was failing to circulate through the economy. It did help moderate a serious problem which was that money was failing to circulate through the economy. Why not just throw it out the window on a windy day then. I’m sorry but I also have to add my two cents because this is the newest line used by politicians. The roads, sewage, cops, whatever are a result of the wealth created by industry. People get jobs at a factory and pay their taxes which support the infrastructure. Private industry pays for all of government. Government is a creation of society, it did not create society. I cringe when I hear this because you have politicians effectively raising a mob to attack “That guy sitting safely in his factory.” by telling people that they just live of what you and the government provide and not the other, correct, way. Don’t bite the hand that feeds you and then wonder why you are hungry. Well lazy, that’s what’s known as the broken window fallacy. The taxpayer funds thrown down a rat hole by the profligae spending of these miscreants, is money that would in fact rattle around the economy, if thee Government didn’t steal it from the productive people who generated that wealth. Instead the administration for totally political reasons chooses to say who shall be the winners and losers. And as we have seen they are better than most at picking total losers. The department of energy has so far produced NO energy, and simply gets in the way of those who do. Intel’s planned 14nm, 300mm wafer fab in Arizona will cost ~$5b, but this is bleeding edge tech, flat PV is old tech, you can convert a 20 year old fab to make it. The tube stuff may be a different story! There is too much misguided education in the new post normal education system in modern Western society that propagates these myths about “evil industry” and “evil corporations” and “evil employers” who are demonized as exploiting everything and everyone. The reality could NOT be further from the truth. It is actually the politicians and their crony capitalist friends (like Solyndra and others, there being a great many examples on either the right or left of the political divide) and lobbyists that are have become a HUGE parasitic problem. They are the Elephant in the Room. When political departments declare CO2 a toxic substance requiring regulation….well to put it mildly, Houston, we have a Problem! There have been a couple of comments about the folks from Solyndra invoking their 5th Amendment rights in Congress. They are being investigated by another branch of the Government, namely the FBI. Any comment they make can, and likely will, be used against them should a criminal case be forthcoming. Remember that Martha Stuart was locked away for not telling the truth. Likewise “Scooter” Libby. Solyndra officials cannot take the chance of making a false statement in Congress and are well advised to follow their lawyer’s instructions regarding their right to not answer questions. And let’s not forget some of the other “commercial” boondoggles that taxpayer money is propping up. Also caught up in the Solyndra swill, is that genius who thinks that the answer to the world’s transportation problems, is a $100,000 “sports” car powered by chemically noxious batteries. That’s what they need in the Maldives, or in Eritrea and Somalia, to cut their energy usage. I once helped found a high tech startup company; there were eight of us, and we built what at one time was the largest supplier of LED products in the world. We started the company on $350,000 ; less than 0.1% of what Solyndra just blew away in smoke, (and mirrors). And that 350 K came right out of our own pockets; with relatives, and a handful of friends. Not a dime of public money; nor any venture capital financing went into the start-up. Nowadays you need $100 million to start a lemonade stand. At its height, we employed about 1000 employees stateside and in Europe; plus about 3,000 more in offshore assembly employees; who enjoyed the highest pay and working conditions they had ever enjoyed in their lives; and that was in Singapore; not exactly the pauper capital of the world. Can’t recall if the Santa Clara Dog Catcher ever visited our plant; but if he did, he would have been the highest level politician to do so..
More info on oil company taxes. Note that the oil industry is one of the few industries where taxes generally EXCEED profits. What is so puzzling is that people seem so blissfully unaware of the HUGE tax burden on Oil & Gas companies. If access to oil was not so heavily restricted and taxed by Governments globally then you can bet you would all pay a lot less at the pump! Thanks for the descriptions of their tech. Now I see it, Solyndra was making solar cylinders. Now I get the joke. And those who will be still be paying for that “renewable” joke and the rest throughout their working lives are currently in kindergarten, being indoctrinated in respecting Mommy Gaia by being Green, since only solar and wind and curly light bulbs will save her from their parents’ evil planet-killing energy-wasting ways. Those low watt light bulbs will save the planet? It is like throwing a sugar cube into Loch Ness hoping to make the water sweeter. When will governments start to realize that clean energy although some may think it will make the planet sweeter, is so expensive to produce, that it’s better to put money into updating coal fired generators that will cut carbon emissions, particularly if they switch to black coal instead of brown. China’s doing it, and actually they are smarter than all the EU countries who are going broke and have found the clean energy efforts have done nothing to cut emissions. And have not created jobs either. Solyndra Green – It’s People! Darren are you referring to the Sci-Fi movie of the 70s? LOL, where they recycled people before euthanizing them into food? Very few of these tax breaks are specific to the oil and gas industry, so removing these tax breaks would not be specific to the oil and gas industry either – unless they were written that way. If that were done, it would just be another shameless money grab. Also, I do not equate tax credits with a straight out payment directly from the Treasury – big difference. You’ve also failed to point out how the oil and gas industry has “squandered” these misnamed “subsidies”. If you’re arguing that these tax loopholes should be closed, fine. I’m all for it. Think of how much GE would save on Tax Attorneys and Accountants. It only makes sense. We use too much cropland to grow biofuels, so why not recycle and reprocess people into food? It will help with the overpopulation issue as well. We simply issue people ration cards (embedded NFC chips will work) and when they use up their ration of resources, we ‘send them to go live an a farm.’ We could even fund a big send-off bash, if we’re feeling generous. Of course, some people are more equal than others, so they would get a bigger ration. And there would be exemptions for doing the right things, or extra incentives (resource credits) for doing things to promote the common good. Government was created to serve the citizens. It’s primary purpose is to protect our rights. As I citizen, I have an obligation to pay taxes and obey the laws. Government does not allow me to be prosperous as I, a citizen, am the government’s master. Scooter Libby suffered a miscarriage of justice because of a mad prosecutor and a complicit media. He’s wanted at a harrowing. If the CFO of Solyndra is immunized by Congress, he may testify to the fraudulence of the $75 million from Argonaut. The art of accounting is before the world. This new model is perfect. Lets just Greece the skids and go forth. Fed gov’t has established that Wind onshore is now at $68 and coal is at $67 per mega watt. Oh so clean. Gov’t loop holes. My utility is required by law to purchase the wind power from the producer(subsidy) at the PUC established rate. This utility then must sell the added wattage to its customers by increasing the coal/oil plant costs/watt. REA-CPUC allows the manufacturer of Fed electricity to sell to a worthy municipal utility at a less than cost factor, and then for that utility to resell any unused (always budget more than a city can use) to the established mainline utilities at a mark up above the manufactured rate. Solyndra picked the wrong technology end of…Rank poor management exposed by rank poor government! China loved it though! Remember the film “The Producers” ??????? Solyndra was a worked out in advance,cold,calculated FRAUD!!!!!! Just look at the company logo KD. They deposit a non silicon photosensitive layer; somewhat akin to the drum in a XEROX machine, onto the inside of a glass tube; well thousands of them. The theory is the sun can hit the tube from any angle, without steering, plus it can receive diffuse solar energy from the blue sky, or the white cloud cover. 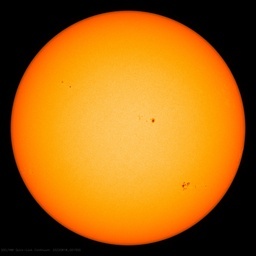 So how many orders of magnitude down is the blue sky from the solar image surface. And aren’t those clouds infra-red sources ? Well their glass tube has pi times the amount of glass as the flat glass protective cover on conventional solar panels, and the projected area of those tubes isn’t any greater than a flat plate. And blow me down, if you put those glass tubes side by side touching, then they shadow each other so you have to space them apart by quite a distance to capture dawn to dusk sunshine. Can you see that land area evaporating before your eyes. Tilted panel arrays look great in terms of peak solar output when pointing directly at the sun; but you can only make them so big and then they shadow each other NO MATTER HOW you geometrically arrange them. You cannot beat the total output from a simple totally flat solar cell array parallel to the ground, in terms of AVERAGE WATTS PER SQUARE METRE. It’s land area they aren’t making any more of. The Solyndra “technology” is a ball busting joke. And they were betting on the price of silicon continuing to rise. Hey after the Arabs run out of oil; guess what pile of raw material they have the most of next ? And who is going to clean all those glass cylinders when the birds crap all over them. I can’t believe that otherwise intelligent investors bought into the tubular scam; and it amazes me that the lame stream media still haven’t discovered that the problem was; it’s a juvenile; not even 4H club way to try and herd solar energy into a corrall. Try to find out from Solyndra sources just what the average Electrical Watts per square metre of their fully installed solar “panels”, and how many Watt hours per day say at 45 deg N latitude on a mid June day. Sorry D, the Obama White House has tried to pin Solyndra on Bush. They may have examined it; they NEVER fast tracked it whatever that means; and BEFORE Bush left office; they soundly rejected it; so that dog won’t hunt. Yes I’m sure these scoundrels tried to scam the Bushies; corporate welfare types don’t care which prostitutes they approach. But this one is Obama and his yuppies and Energy Czar Steven Chu; who thinks you can educate microbes to make energy. And it has nothing to do with the chicoms. Even if their manufacturing costs were zero, Solyndra would still go belly up; because they don’t make useful solar energy collectors. And please don’t include taxpayer subsidies in your accounting of solar energy growth. This whole thing stinks to high heaven. They’re a hive of nest-feathering, trough-snouting shysters and let’s all hope they get fingered for it – right up the chain to O’Bummer. I for one am sick to death of seeing and hearing about this monumental waste of money – and what makes it even worse is that it’s not even money that’s in the coffers, it’s just more debt being piled upon more debt. Sheer, utter madness of the first order. Stimulus money is never spent well. Whether it is money tossed by Republicans (given to companies to rebuild Iraq) or Democrats (given to companies engaging in green technologies). At the very least, stimulus money schemes should require 2/3rds majority in both the senate and house as well as by approval by the Pres. My personal preference is that it be outlawed. Your argument is fundamentally flawed. “Good or bad” does NOT depend on one’s ideological outlook. The basic function of a subsidy is to produce a significant net benefit to the entity issuing the subsidy. If it does, then it is “good”; if not, then it is “bad”. It’s not too difficult to find a significant benefit provided by domestic oil production, even when the industry as a whole enjoys large profits. But Solyndra and quite a few other sketchy “green” startups were a longshot, at best, at realizing a net benefit. That there were officials within the administration trying to put the brakes on this deal goes to show that this subsidy was little more than speculation. That the loan was restructured to put tax payers last in line to recoup appears criminal. I find your moral equivalence of the two ridiculous. In the mid-70’s I worked part-time for the Sunshine Collection Agency of Boulder, CO, a small (6-8 employees) fabricator/installer of solar hot water panels & systems. We fabbed collectors with treated wood frames, black-painted sheet metal, and standard 1/2″ copper pipe. Simple, reliable, and reasonably efficient (about 60% system efficiency, as i recall). Like most of the several-hundred small solar firms around the southwest, the owners of SCA weren’t getting rich but they were doing OK, and the industry & technology were seeing modest but steady growth. Then Jimmy Carter was elected. He declared the energy “crisis” the moral equivalent of war, and with great fanfare announced tax breaks for homeowners who purchased solar heating systems, roof insulation, etc; and incentives & direct grants to SS manufacturers. Problem was, it took congress over a year to actually pass the legislation, and in the meantime homeowners quite sensibly deferred ordering solar heating systems in order to get their promised tax breaks. None of those small solar companies could ride out a dry spell that long; they all went belly-up. But a lot of big corporations saw the opportunity for some easy profits, so they (also) quite sensibly jumped into the solar heating business. Most of them had zero experience. Grumman Aerospace came out with a line of way-cool collector panels with airfoil-shaped clear acrylic covers . . . which behaved like airfoils and popped out in as little as 20mph winds. Citgo and some of the other petrogiants had similarly ridiculous products. The net result was that the small, innovative companies were starved out, the big “dumb” corporations produced junk but pocketed hundreds of millions in direct and indirect subsidies, and the solar heating industry got such a bad rep that it pretty much died for almost 25 years (and I got aced out of a nice part-time job; but at least I got a little back in the early ‘80s. Just before the energy tax credits ran out we re-insulated our attic – we made about $60.00 on the deal). Anything the private sector can do, government can do worse. yes , the harowing moment of discovery in Soylent Green. Stan Stendera at 3.24 am. Actually I feed the birds too. And water them from my rain water tank that the government subsidised. I give them a bit of wholemeal bread, and bird seed for the little ones and then bigger seed for the parrots. They are quite tame too now, the cheeky blighters. The sit or fly near my computer rooms window and look down at me. I wonder if the government would subsidize my expenditure per week, about close on $15 – $20 particularly during their mating and breeding season and cold weather. I fear for them as it is unusually cold for early October, going down below zero at night. Hope the hatchlings can cope with it.